Switzerland is traditionally considered to be the most spectacular country in the Alps. Its nature, hospitality and gastronomy are world famous. 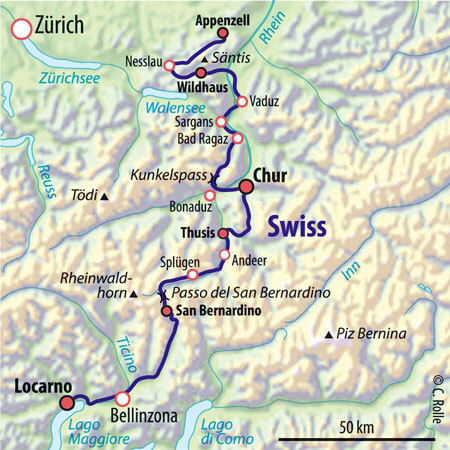 Our Transalp Swiss utilizes mostly good paths across the Swiss Confederation from down-to-earth Appenzell to the sophisticated, almost Italian feel of Locarno on Lake Maggiore. In between lie the rolling pastures of Heidi country, the white rock massif of Santis, the famous mountain bike trails of Lenzerheide, the natural spectacle of the ancient Via Mala and, of course, the 2066 m high San Bernardino Pass. We'll wake up in the most beautiful Heidi country. The spectacular flanks of the white Santis massif want to be conquered by us. But we'll reach Schwägalp faster than expected. Riding through lush alpine meadows, with the imposing cliffs of Santis in view, we'll ride down- and then uphill on our way to Wildhaus. By now we know why Swiss cheese tastes so good. There's no more beautiful way to start the day: wide sweeping views over the Rhine Valley. We'll swiftly whiz down into the sleepy, once fashionable spa town of Bad Ragaz. After the lunch break, the Kunkelspass will challenge us. Graubünden lies below us with one of the oldest cities in Switzerland: Chur. For those who don't want to climb to Lenzerheide, the postal bus is an alternative. The ascent to the quaint mountain pasture of Alp Fops on the legendary Panorama trail is a delight. The descent to Thusis on the "old Schin" path is one of the best mountain bike downhills in the Alps. We'll spend the night in Thusis. We'll start the day with the storied path through the "Via Mala" gorge. Steadily, the trail climbs to the valley of the Hinterrhein river. We'll roll past ancient houses. The San Bernardino Pass has always been an important trade route, but our route turns its back on the traffic. In the afternoon, we will reach the 2066 meter high pass plain. Ticino lies ahead. We'll stay the night in San Bernardino. We'll reach the sunny side of the Alps, greetings from Italy. The descent on small, initially tricky paths seems to have no end. We'll take a break in a traditional "grotta" (cave), then we'll quickly head for Lake Maggiore. We'll stay in Locarno, right on the lake, where we'll celebrate with a farewell dinner. After breakfast, the bikes are loaded onto the bus. Return trip by bus back to Appenzell. Upon arrival, everyone travels home individually. Adrian Schröder, ALPS bike guide for the Transalp Swiss and Transalp Engadine. Arrival: Arrival by car or by train Appenzell/Switzerlnd. Type of route: Forest and gravel paths, paved secondary roads, trails. Included in the price: Guided tour with 6 overnight stays and half board (breakfast buffet, multi-course dinner menus) in good 3- or 4-star hotels in a double room, sometimes with wellness areas. Luggage transport, return transfer in a comfortable bus.